The amazing salve that started it all. Slow infused with organic herbs and love for a highly effective extra strength healing skin treatment. Ora's Amazing Herbal is a family owned, ethically run and sustainably operated business. Never tested on animals. Gently scented with anti-microbial essential oils of rosemary, cedar leaf, and tea trea, known to help prevent damaged skin from becoming infected while promoting healing. Artisanally crafted using non-GMO grapeseed oil, organic and fair trade herbs, coconut oil and vitamin E.
Use as an intensive repair treatment for dry and cracked hands and feet. Apply to feet at night, put on socks, wake up to healthier skin. 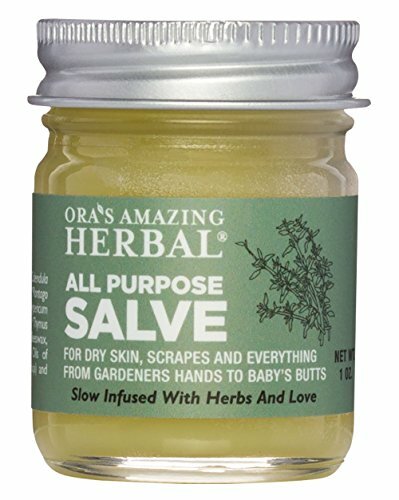 This salve works exceptionally well to help dry, irritated, and inflamed skin.